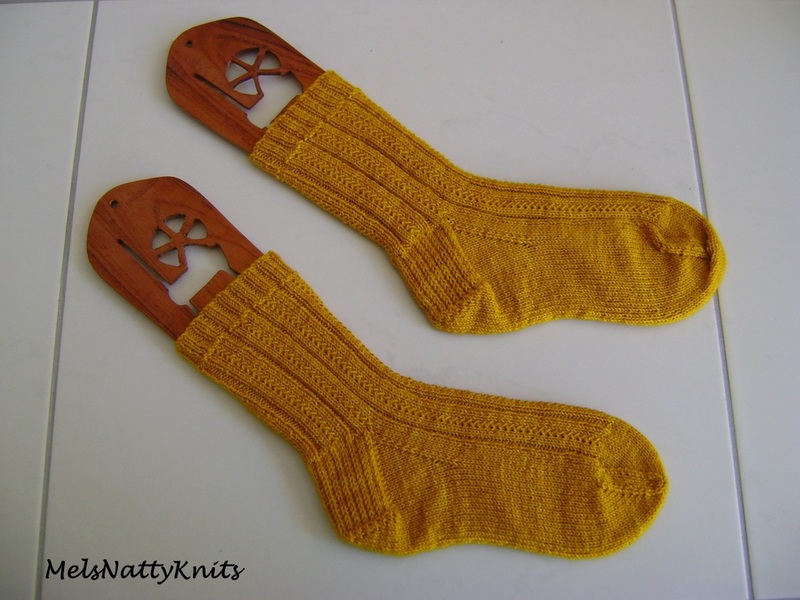 In September whilst surfing through Ravelry, I spotted a request by Rebecca from Augustbird who was looking for some test yarn knitters so I put my hand up to knit a pair of women’s socks and test their White Gum sock yarn. 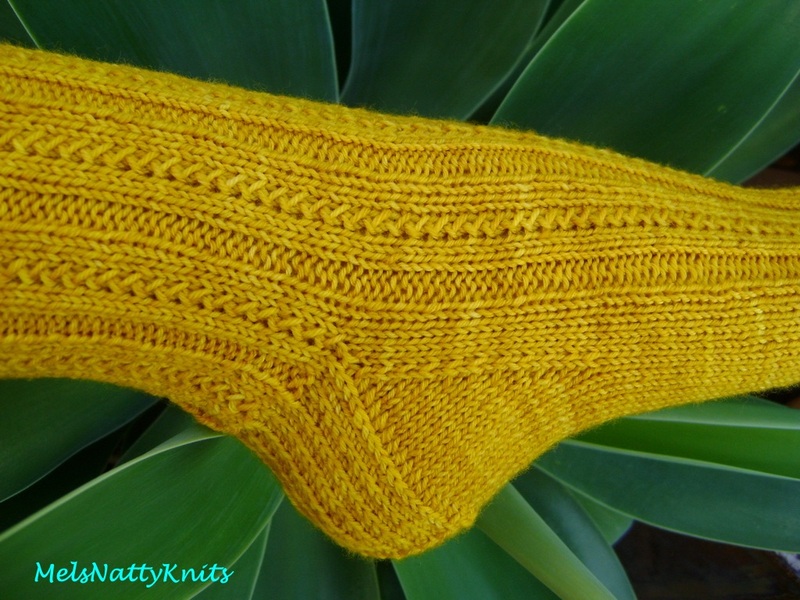 I used the Simple Skyp Socks pattern so I also received a complimentary copy of the gorgeous Cloudfall Cowl. 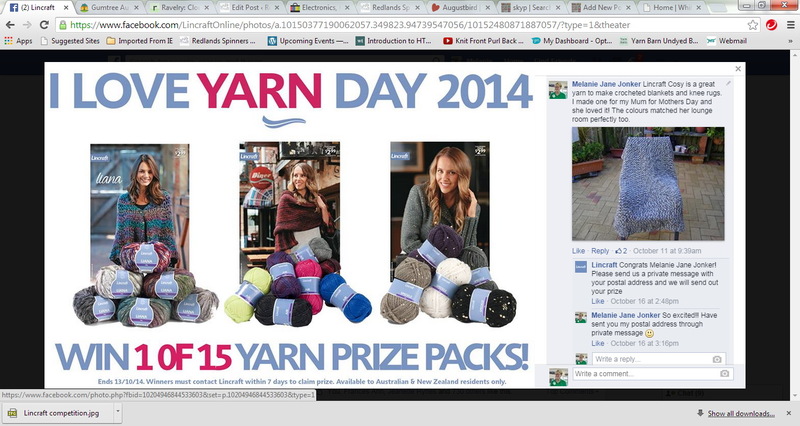 For my efforts, Rebecca provided me with a $40 voucher to spend on her yarn. 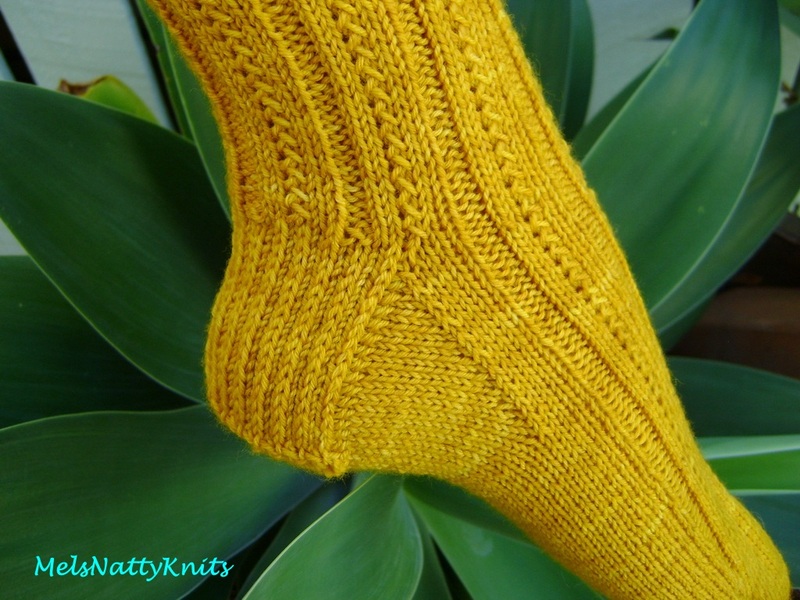 I used the Simple Skyp pattern as I had previously knitted a pair of socks using this pattern and they turned out particularly comfortable. 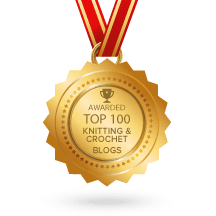 I was also asked to start a Ravelry project page which I did. 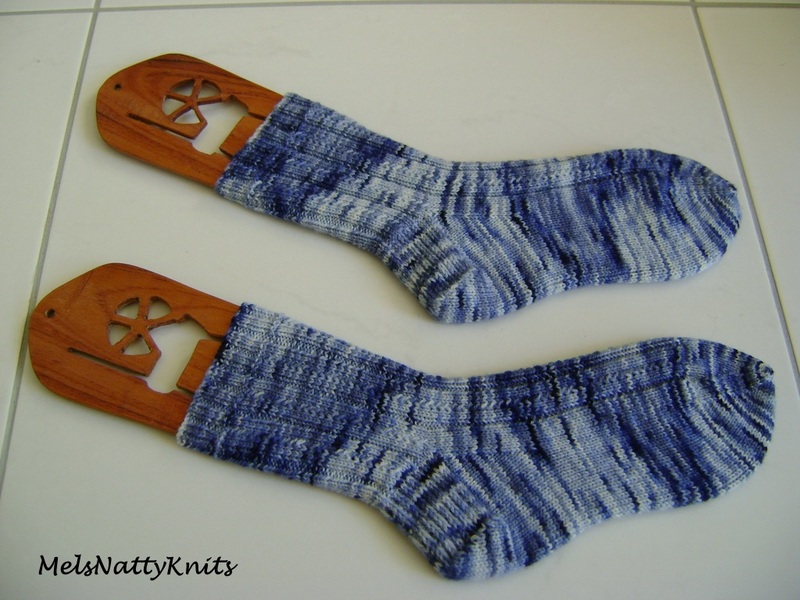 These are the Skyp socks made using Augustbird’s yarn in the colourway ‘Ink’. 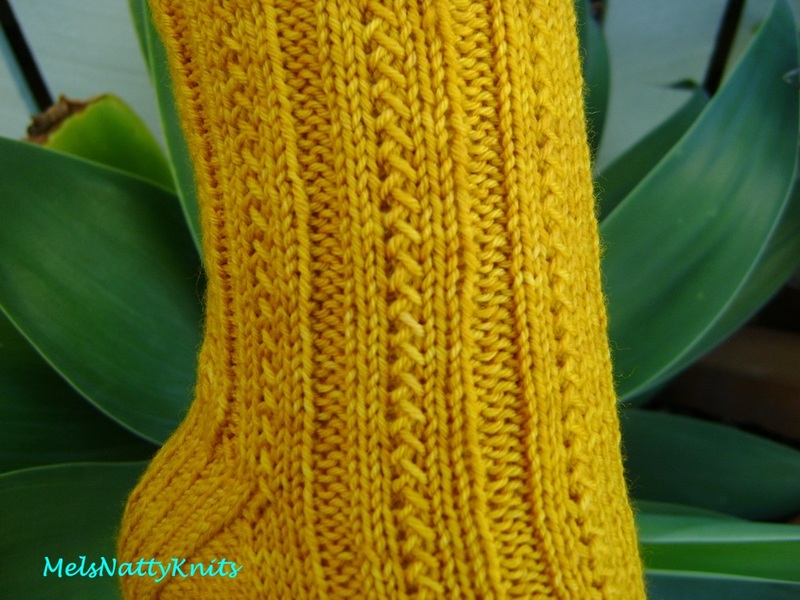 This is an easy pattern to memorise and adds just a bit of interest rather than plain stockinette stitch. 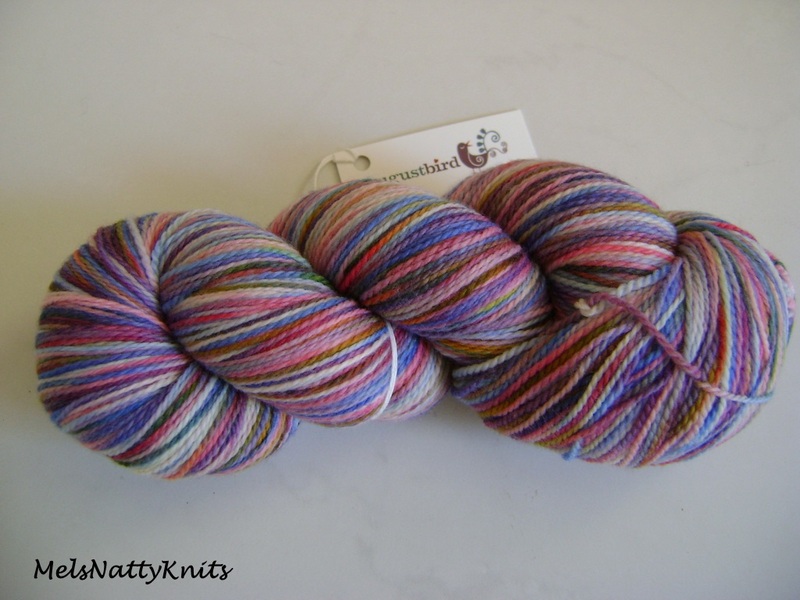 I sent off the completed socks to Rebecca and received my $40 voucher so I checked out Augustbird’s website but was disappointed as the October colourway called ‘Songbird’ had sold out. It was such a gorgeous display of colours. 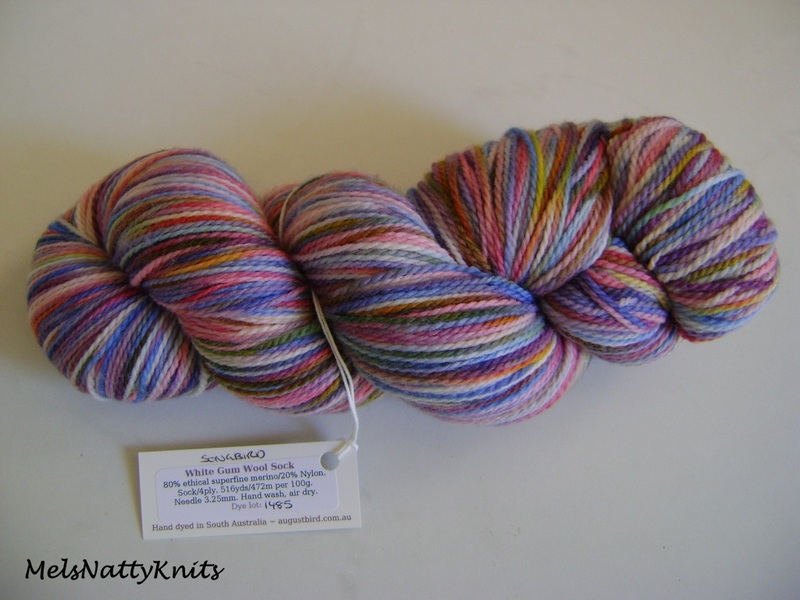 My luck changed, however, when I spotted a FB post declaring there were a couple more skeins of Songbird to be had! 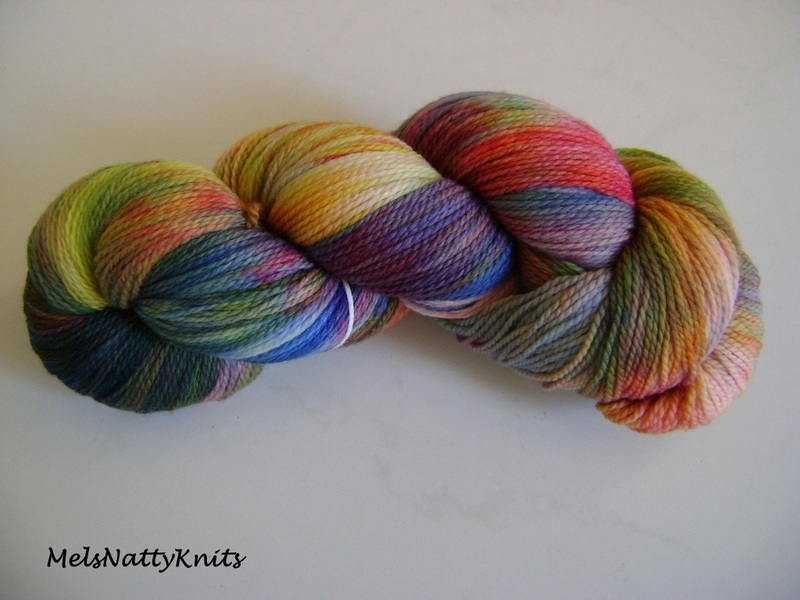 I was as fast as a sprinter off the blocks to get those two skeins and here they are! 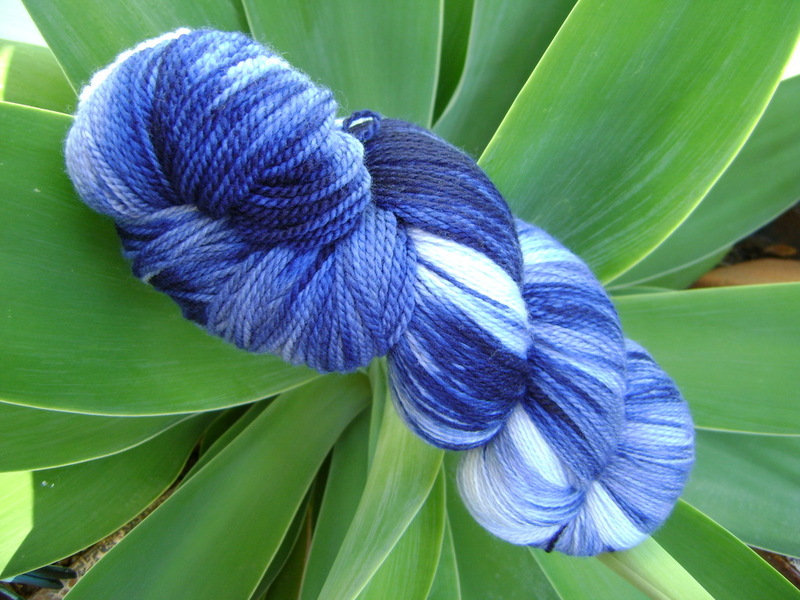 This skein is White Gum Wool Sock which is an 80% ethical superfine merino / 20% nylon yarn and the colourway is Songbird More Blue. 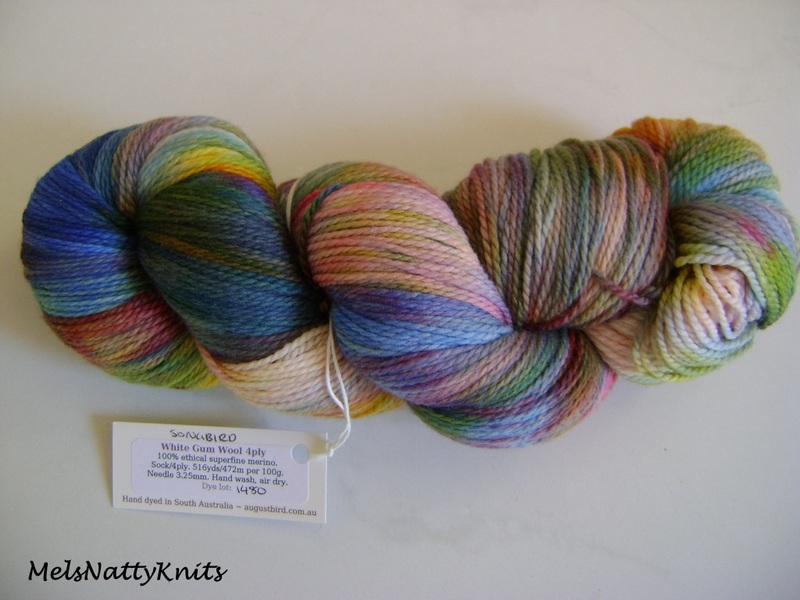 And this skein is White Gum Wool 4ply which is a 100% ethical superfine merino wool and the colourway is Songbird. 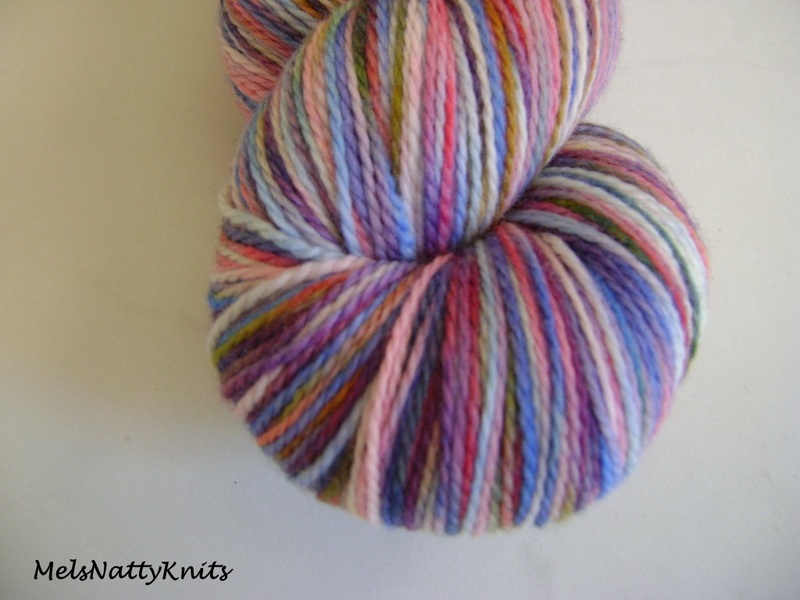 I got a bit carried away taking photos as the wool is just so incredibly gorgeous! 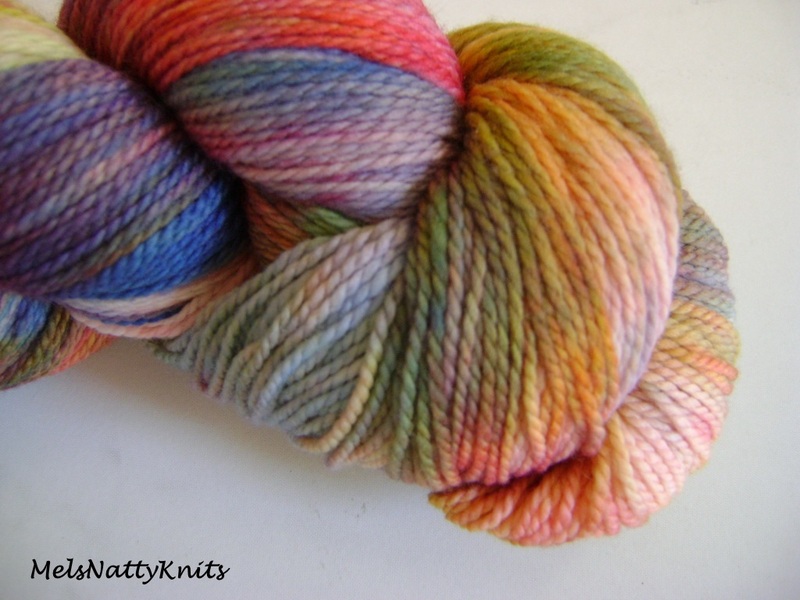 Each skein was $28 so I only had to pay the $16 difference plus postage. 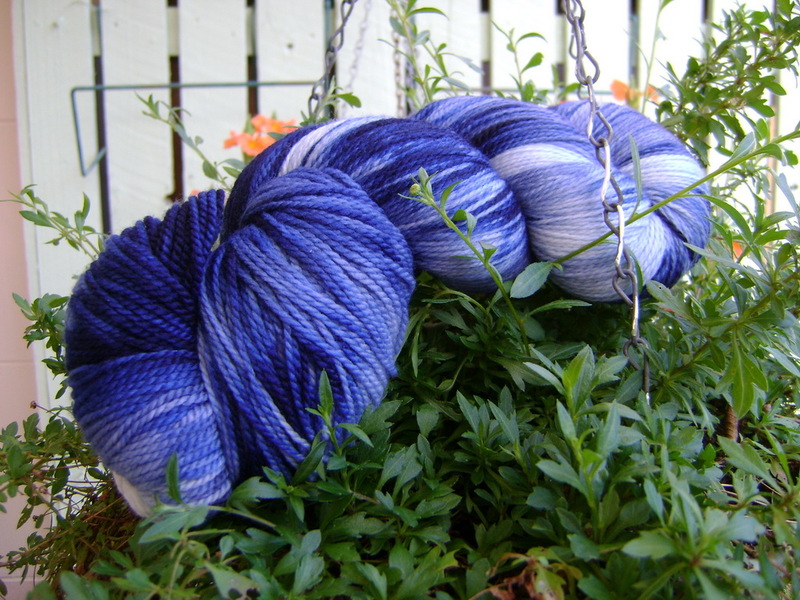 It was worth it as I now have two gorgeous skeins of yarn to stash until I find the right pattern. 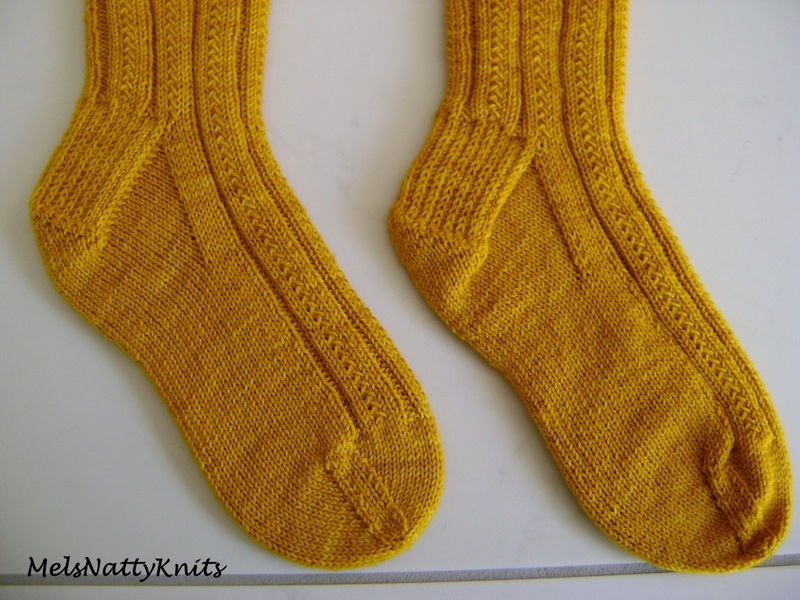 I really enjoyed the test knit as I was in the mood to knit another pair of socks. A couple of weeks ago as I was looking through Ebay at spinning wheels for sale (something I do quite often and shouldn’t! 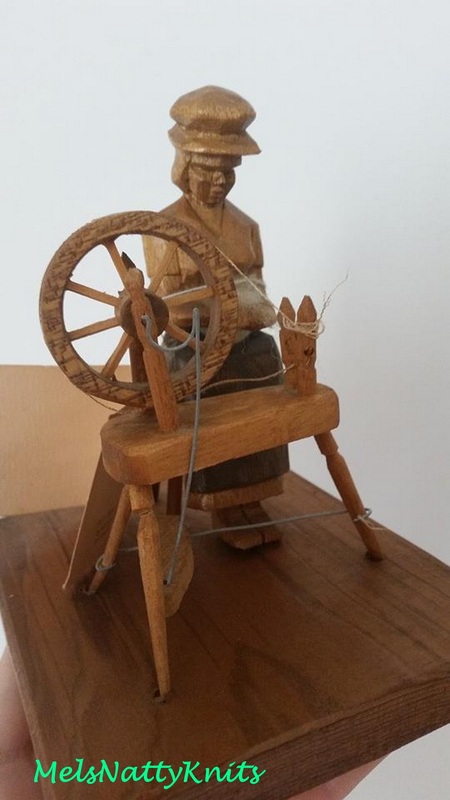 ), I found this rather unusual Australian wooden carving of a woman at a spinning wheel for sale. Well, I just had to have it so I clicked on ‘Add to Cart’ and voila! it was mine. 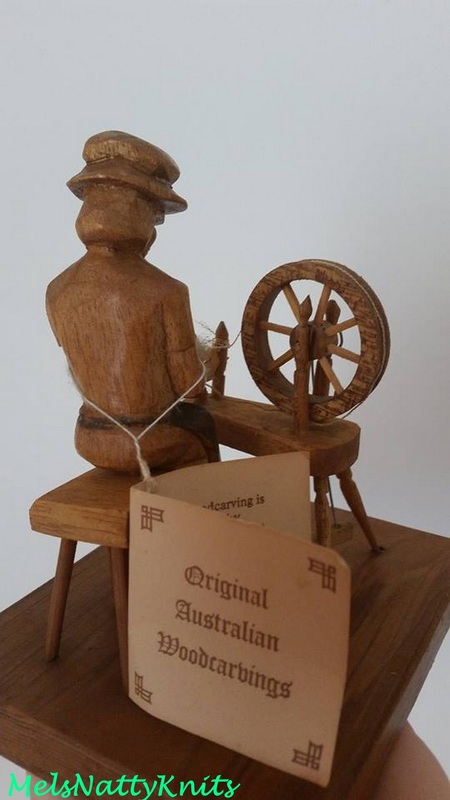 It really is quite exquisite and is one more knick knack to add to my ever burgeoning collection of all things yarn, spinning and sheep! 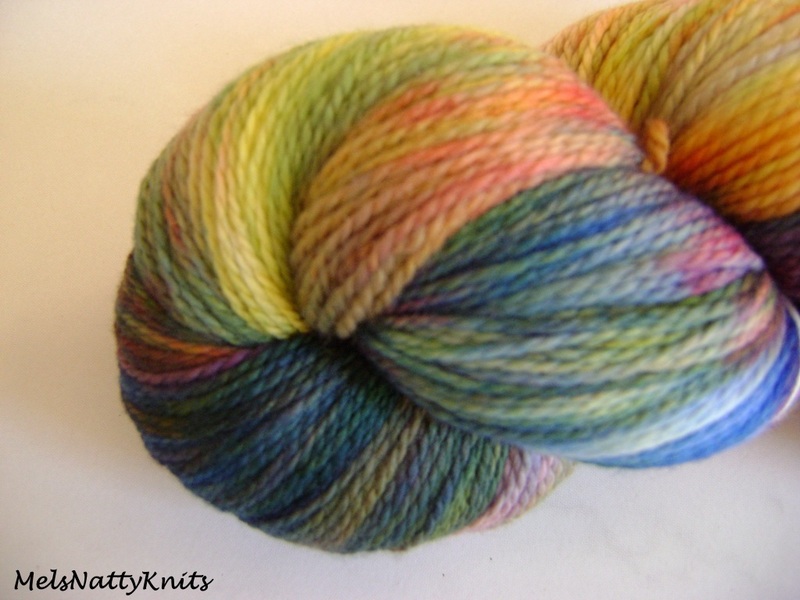 I also seem to spend a bit of time on Facebook catching up with friends and posting photos of my spinning wheel purchases and yarn projects. 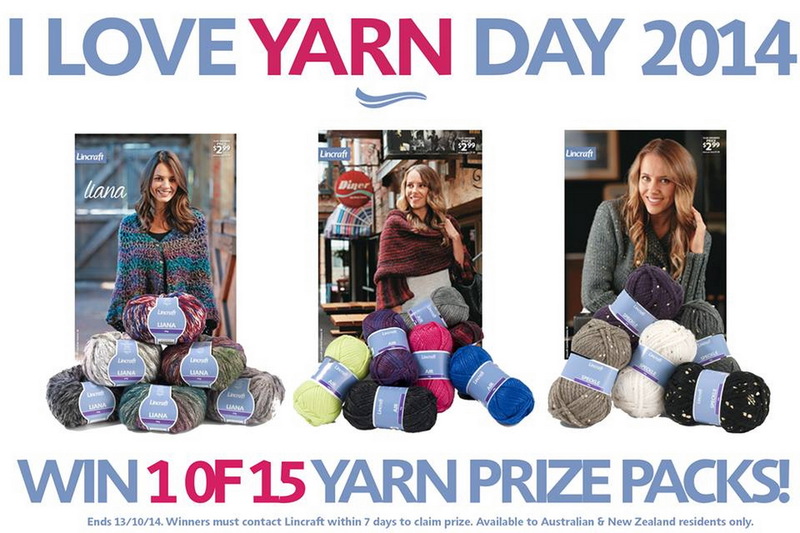 One page I have ‘liked’ is the Australian Lincraft page and last month they ran a competition for their I Love Yarn Day 2014 asking what was your favourite Lincraft yarn and why. 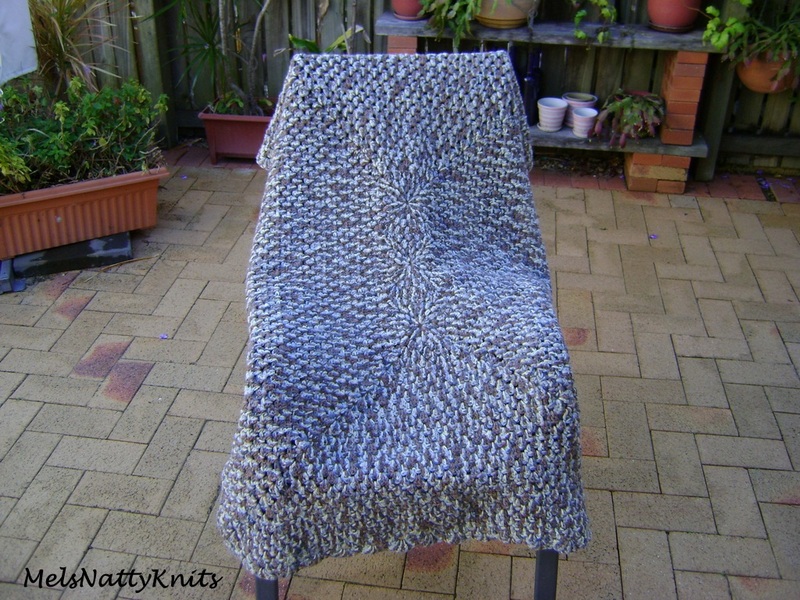 Last year I crocheted Mum a lovely throw using Lincraft Cosy wool and gave it her for Mother’s Day. She loves it! The colours were quite unusual and really matched Mum’s lounge room so I used this photo and similar words and posted them on the Lincraft competition page – see bottom right of the picture below. 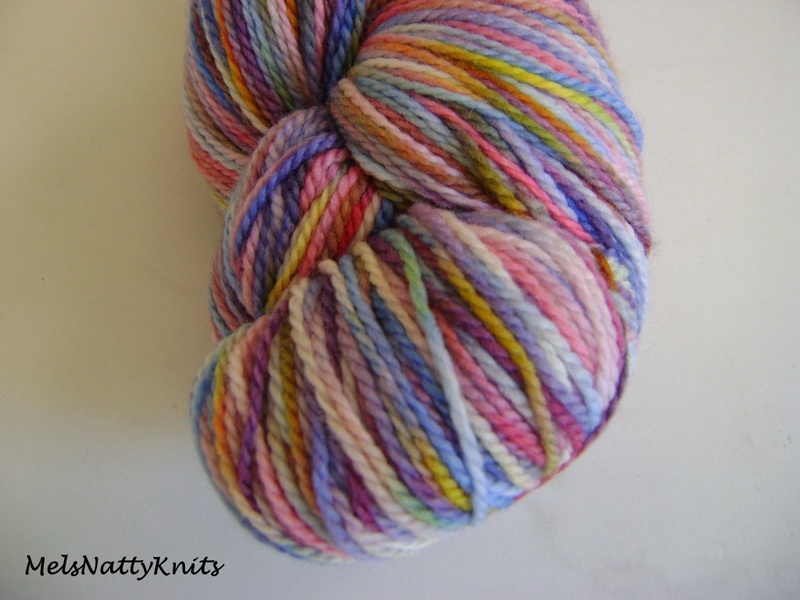 What a lovely surprise to receive a comment under my photo letting me know that I’d won one of the yarn packs which arrived this week. 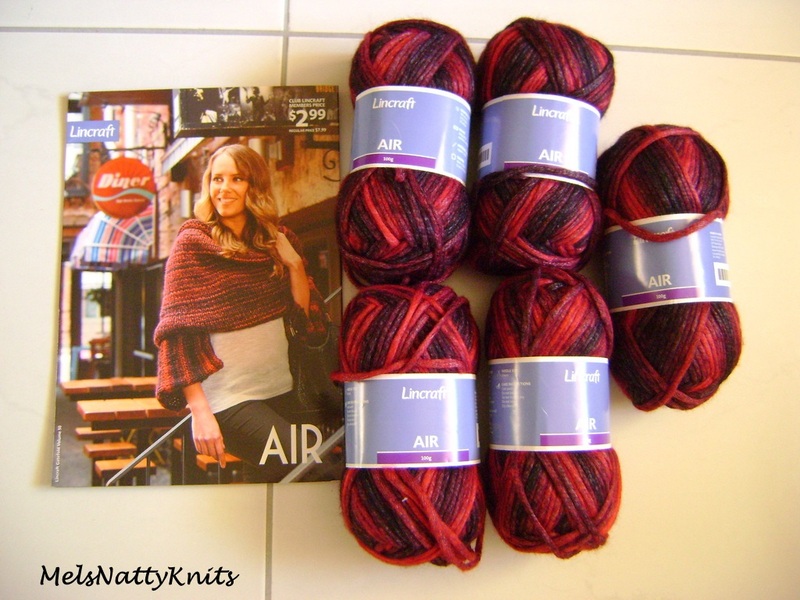 The pack contains five balls of Lincraft Air which is a super bulky yarn made with 78% acrylic / 17% nylon (polyamide) / 5% wool. 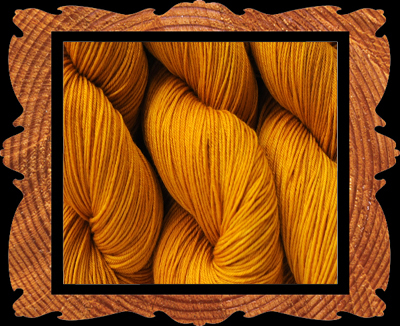 The yarn uses size 10mm needles. 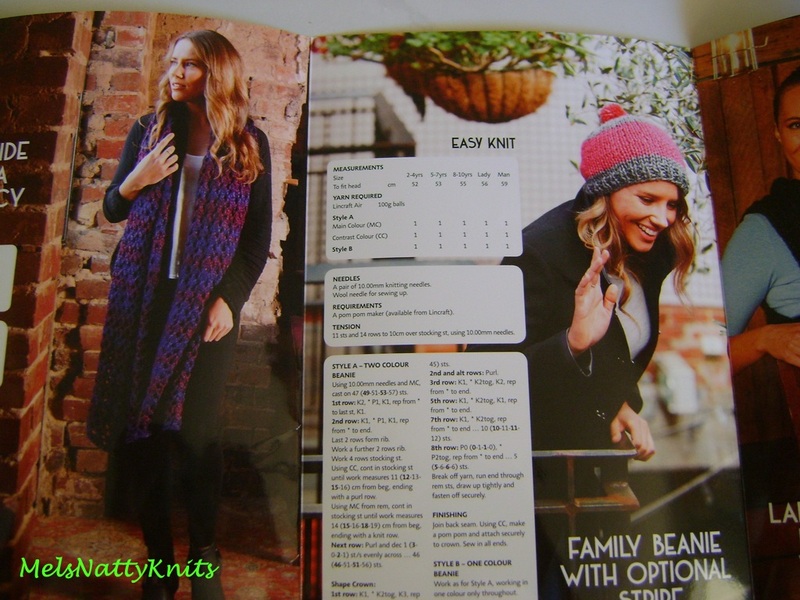 I’ve decided I’ll knit the scarf and hat from the pattern I also won. Hopefully, I’ll have them made by next winter! 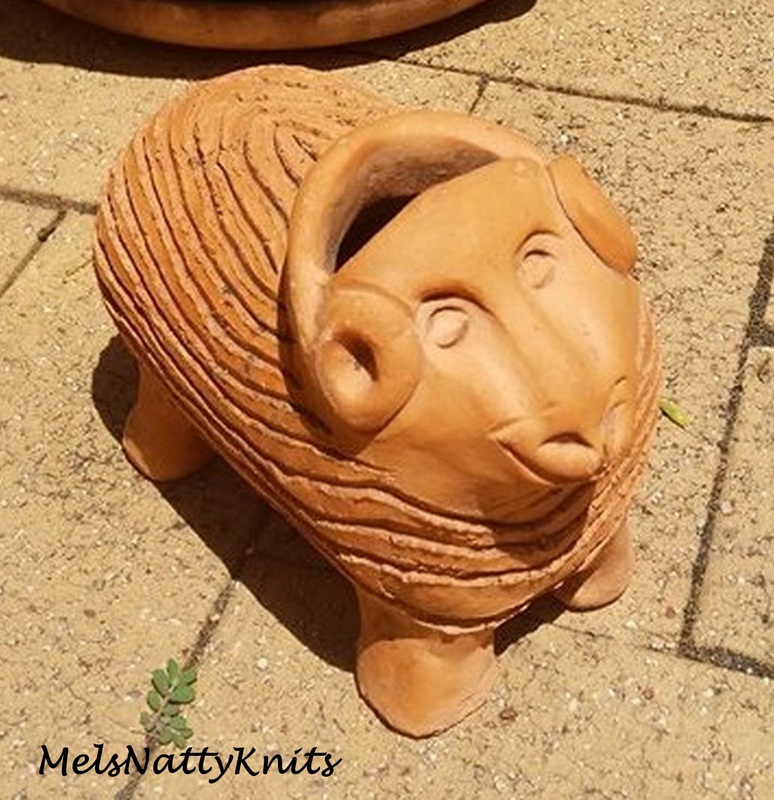 Or maybe I should aim for March next year as I’m cruising around New Zealand in April and I’m sure it’ll be a bit nippy on board as well as on land where I aim to try and visit some yarn shops (surprise, surprise!). 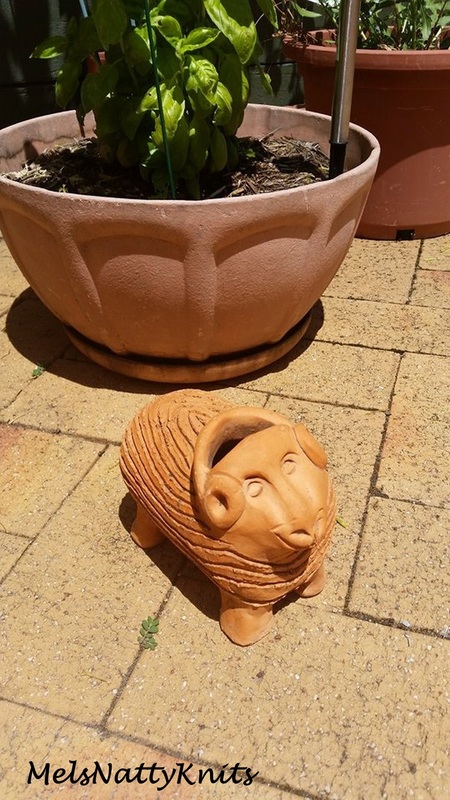 And lastly, I found this cute little terracotta sheep near my Mum’s front door. She’d been doing a bit of re-arranging of her garden ornaments which is why I’ve never seen it before. “Is that a sheep Mum?” I asked. “Yes it is, would you like it?” she replied. Of course, you know what my answer was don’t you? It now resides near my back sliding door. That’s enough yarning for now!